17-year-old Nicholas has not let his diagnosed athetoid cerebral palsy and seizure disorder hold him back. The Ossining tenth-grader is an avid athlete who enjoys baseball, swimming and yoga; however, increased communication and academic demands began to pose a challenge for Nicholas. Almost a decade after attending Blythedale's Day Hospital program to learn how to use a power wheelchair, Nicholas was readmitted in September to continue his journey in assistive technology in order to maximize his independence. His therapy team assessed his augmentative communication, participation in academic tasks, and ability to control his environment. 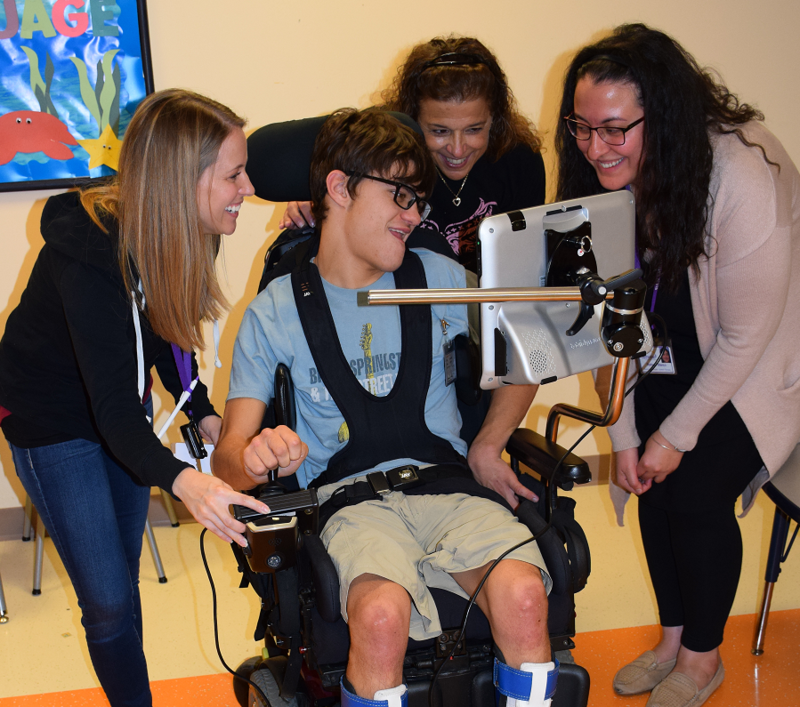 Speech therapists, occupational therapists,and physical therapists collaborated to optimize his use of his Tobii Dynavox - an augmentative communication device. Nicholas is now able to access the Tobi Dynavox screen through two ways: with his hands through the use of a joystick and via eye gaze technology. The device is now mounted on his power wheelchair in preparation for long-term usage. And to help ensure Nick doesn't lose any ground academically, he attends the Hospital's onsite school daily. Nicholas' mom is excited to be back at Blythedale and looks forward to more positive outcomes. To learn more about assistive technology at Blythedale, or to watch a video highlighting our program, please click here.